Redmond's Annual Bike Party on Bike to Work Day! The annual party for people who bike (and those who want to) is on Friday, May 17th. Kids Bike Rodeo! Kids Activities in Celebration of "Kids to Parks Day"! We're finalizing this year's design, but we know you're going to want one! To earn a Go Redmond bike shirt you'll just need to take a bike trip in May and add your trip to the ​Go Redmond calendar. Shirts will be available for pick up at the Bike Bash! Shirts are only available for adults 18 and older. New riders and experienced bike commuters can learn from our local bike shops at Skills Clinics happening during the Bike Bash. Adult and child bicycle helmets are on sale each year at the Bike Bash for $10 (cash only). Individuals wearing the helmet must be present to assure proper fitting. Serving local beer and wine and a specialty "bike" cocktail, the beer garden is the best place to celebrate with your team. The Dogtones are a Pop-Rock cover band featuring three accomplished lead vocalists, soaring harmonies, and a rock-solid danceable backbeat. The Dogtones play songs spanning several decades that virtually everyone has heard...from easy listening to party classics. Local Redmond bike shops will be at the Bike Bash answering all your bike related questions and helping you find your next (or first?) bike and all the gear you need to enjoy the ride. 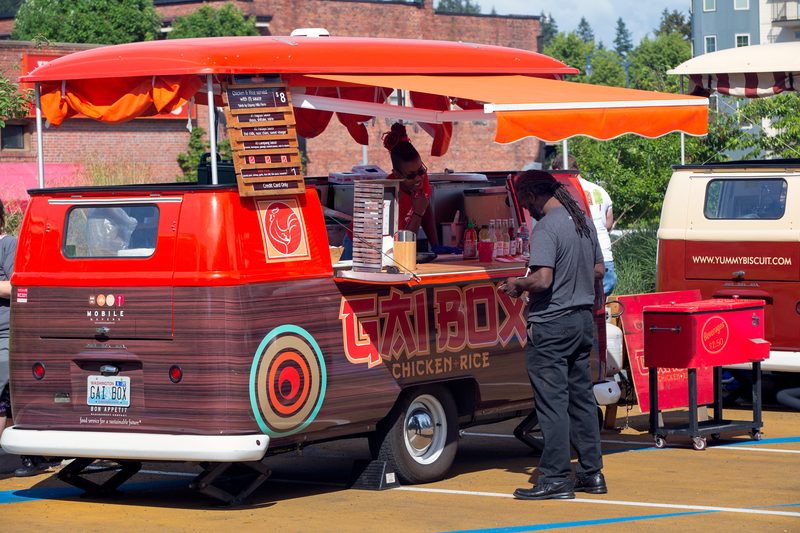 There will be plenty of food available for purchase along Bear Creek Parkway, next to the Redmond Central Connector Park from these food trucks-or grab a bite at one of the local restaurants around the park! A Bike Rodeo gives kids a chance to practice bike handling skills in a safe and controlled setting. Kids who complete the course can earn some great safety gear from the Redmond SchoolPool program.